It's one of the spiciest, nuttiest, most aromatic and versatile—not to mention easiest—condiments you can make. I first learned about the spiced nut, seed and spice blend dukkah (pronounced DOO-kuh), from Anna Sortun, the chef-owner of Oleana, one of my favorite restaurants, in Cambridge, Massachusetts, and of Sofra, one of the most delicious Middle Eastern–inspired bakeries ever. I've been a huge fan ever since. It's one of the spiciest, nuttiest, most aromatic and versatile—not to mention easiest—condiments you can make. At its simplest, dukkah can be a mix of toasted hazelnuts, sesame seeds, cumin, coriander, a dried herb like thyme or oregano, and salt, all pounded together in a mortar or crushed in a food processor. I make it fairly coarse, so the individual flavors pop, but you can certainly grind it more finely. Any roasted nuts could be added or substituted, as could a wide variety of complementary seasonings like Aleppo pepper, za'atar, sumac, nigella seeds and even coconut. 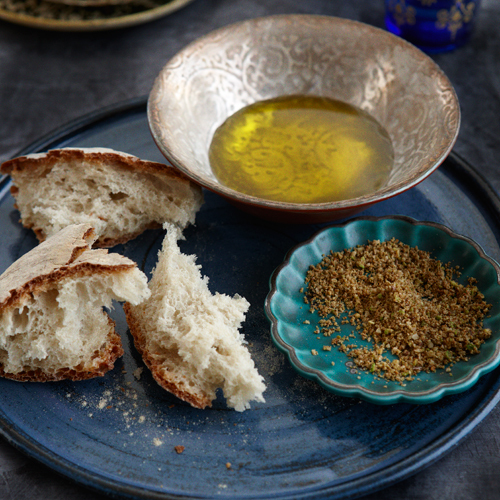 Dukkah is traditionally served as a dip with olive oil and bread or pita, but it's fantastic sprinkled on vegetables, on feta or yogurt, with raw crudités and a creamy dip, or as a garnish on everything from soup, salad and eggs to mashed potatoes, pasta and grilled fish or meats. Here are two great versions to get you started. The recipe pictured, hazelnut-dukka, is from the founder of Backpacker Concierge, a Middle East–focused travel company, and the other is Ana Sortun's dukkah, the recipe that first got me going (served with a carrot puree).